Key Lime, this adorable Li'l Sweet & Sassy stuffed sea horse, is a great companion for all kinds of imaginative adventure. 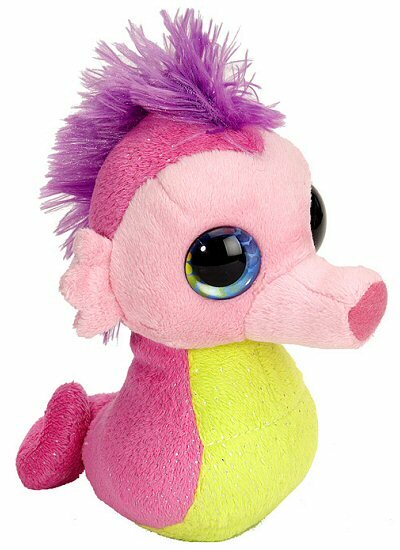 With soft hot pink and "key lime" fur sprinkled with shiny silver flakes, a friendly light pink face, and a wild purple mane, this sweet plush seahorse has the most beautiful blue eyes surrounded by a rainbow of hearts! Look into their depths and you're sure to feel warm fuzzies. Another great thing is that when you purchase this lovable Li'l Sweet & Sassy plush sea horse, a portion of the proceeds helps to provide housing and education for disadvantaged children, as well as protection for abandoned animals throughout the world. Fun Facts about Sea Horses: Did you know that Seahorses have no teeth and no stomach. Food passes through their digestive systems so quickly, they must eat almost constantly to stay alive? Thanks, National Geographic! Our Sweet & Sassy stuffed seahorse has a wonderfully huggable body of soft vibrant pink fabric with pink circles and spots. This customizable Seahorse fabric wall art is a wonderful addition to any ocean paradise or sea world atmosphere. This customizable Sea Shell fabric wall art brings the wonder of the ocean right to your walls. Lavender, this adorable Li'l Sweet & Sassy stuffed unicorn, has soft white fur, lavender accents, and sparkly purple eyes. Our Sweet & Sassy stuffed octopus has soft vibrant variegated pink fur and a rainbow of sparkly tentacles.